Find out about Mobile Cuisine: The ultimate food truck trade magazine dedicated to delivering to it’s readers, every must-read food truck story bubbling up across the Web. Since September of 2010, Mobile Cuisine has been teaching aspiring culinary professionals how to create successful food truck businesses. 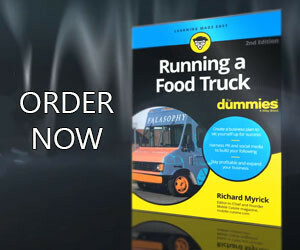 Not by providing bland regurgitated restaurant articles but by providing, Valuable information that can help anyone build a food truck business. Mobile Cuisine started as a simple one man blog by someone looking to start their own food truck. Today, it’s the mobile food industry’s go to online trade magazine with nearly 1 million unique visitors — and it was all done with useful content any mobile food vendor can use. Our mission has never changed: We’ll help anyone build a customer focused mobile food business. Since our inception Mobile Cuisine has been dedicated to delivering our faithful readers every must-read street food, food truck, food cart and food stand story bubbling up across the Web, along with exclusive news, interviews, and amazing photos. Please stay in touch with what Mobile-Cuisine.com is up subscribing to our feed. Also feel free to connect with us on Twitter, Facebook, Google+ and LinkedIn if you’re active on those social media networks.